I know nothing about the inner workings of the Cleveland Indians‘ offseason plans. I know they’ve teased the availability of anyone on the roster not named Francisco or Jose. Other than that, it’s all speculation. With that said, I’m going out on a limb with a prediction here – I think Corey Kluber will still be an Indian come Opening Day 2019. Yes, his name is being tossed around the rumor mill. Yes, at the moment Kluber seems like the most likely trade candidate this winter, if only based on how often he’s been talked about this offseason. Still, my gut tells me he’s not going anywhere (I’ll apologize to everyone if this take ends up backfiring). The reason is simple – Cleveland is extremely miserly when it comes to its starting pitching. The team knows this is the strongest aspect of the roster and, as a result, isn’t going to part with anyone in the rotation without getting blockbuster returns. Per various reports, this appears to be the case when it comes to Kluber. The Indians are asking a ton for their star pitcher, and don’t appear interested in backing down from whatever these demands may be. Knowing this, I struggle to believe a deal will arrive which meets their standards, either because of teams offering too little or Cleveland asking for too much. I understand why the Tribe is hitting the market with high demands for Kluber. He’s been nominated for another Cy Young, is under team control through 2021 and, when he’s on, possesses some of the filthiest pitches in the majors. That last note plays a part in why I think no team will be want to meet Cleveland’s high demands, though, mostly due to the fact he hasn’t been on when it matters most in the past two seasons. 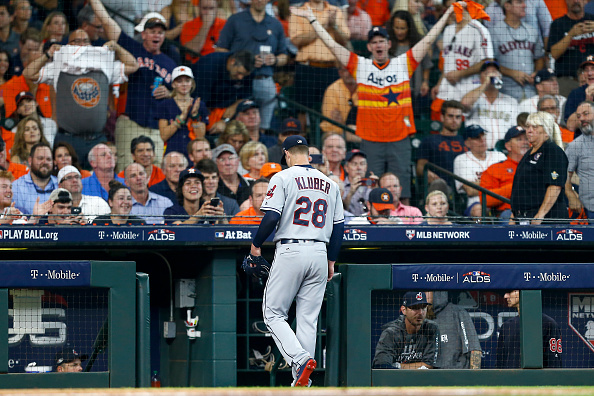 Kluber is coming off an absolutely brutal playoff showing, as he was shelled by the Houston Astros to the tune of six hits and four earned runs in just 4.2 innings pitched. Concern gets increased a bit when you couple this with his disastrous starts in the 2017 postseason. While this is in no way undeniable proof Kluber is starting to decline, it’s at the very least enough evidence to make opposing teams hesitant when it comes to offering a blockbuster deal. Making a Kluber trade less likely in my mind is the kind of returns Cleveland is going to be seeking. Based on everything we’ve heard, the Tribe still expects to contend in 2019. There’s no indication the team is looking for prospects and building towards the future. The Indians want players who can help them right away. Maybe it’s just me, but I struggle to believe opposing teams will want to pony up multiple high-quality players in exchange for a pitcher who, while great, has shown some concerning signs when it matters most. Finally, just remember the Indians technically don’t need to trade Kluber. The AL Central will be theirs for the taking again in 2019, so they aren’t in a high-pressure situation to make moves. While I’m not a fan of this approach to the offseason, it will certainly help explain things should Cleveland have another quiet winter. Sure, the Indians have never teased the availability of their two-time Cy Young winning ace before, which may imply they’re loosening up a bit on their demands. The team will need to make significant upgrades if it wants to catch up to the top-tier AL contenders, and doing so by trade appears to be the only option available. At the moment, though, I’m still not buying a trade of Kluber as a likely outcome, mostly because there appears to be a perfect storm of factors which work against the likelihood of a deal. Cleveland will ask for the world, and won’t back down from this demand. Opposing teams are likely hesitant to give away multiple win-now players for a pitcher who, while very talented, is coming off his third straight postseason shelling. Again, I have no inside track on this. This is simply my prediction, based upon years of watching this team hint a starter might be available before refusing to pull the trigger on a deal because opposing clubs won’t give up the world in exchange. This is my way of saying, if Kluber does get traded, don’t flip out on me. However, my bet is that won’t be happening.